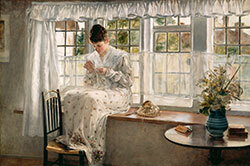 Francis David Millett, "The Window Seat." 1883, Oil on canvas.Organized by the Detroit Institute of Arts, this exhibition features 40 outstanding works by late-19th and early-20th century artists capturing American life, culture, and identity in that time. Among the American artists featured are Thomas Moran (1837-1926), Childe Hassam (1859-1935), William James Glackens (1870-1938), Jane Peterson (1876-1965) and Aaron Bohrod (1907-1992). This exhibition has been organized by the Detroit Institute of Arts and made possible by the Richard and Jane Manoogian Collection. This exhibition and museum collaboration are made possible through the Art Bridges-Terra Foundation Initiative. Generous support has been provided by the Richard and Jane Manoogian Foundation. Teachers can find additional information about the exhibition here. In celebration of all things local, the Dennos Museum Center invited the public to submit digital images of their favorite places in Northern Michigan. See what was submitted here. The Dennos Museum Center has partnered with Here:Say Storytelling and the Front Street Writers to produce and record short stories that accompany the paintings in the exhibition. These recordings feature first-person, true stories that reflect on the topics and content of Visions of American Life to broaden the perspectives available to visitors. Click here to listen. Programming for Visions of American Life is supported by Art Bridges, who focuses on sharing outstanding works of American art with those that have limited access to our country’s most meaningful works.